The Ridgefield Raptors are happy to announce the signing of University of Portland Freshman Peter Allegro. Allegro comes to The University of Portland from Tacoma, Washington, where he’s a four-year letter winner at Bellarmine Prep. Allegro was a Perfect Game Underclass Honorable Mention in both 2016 and 2017, and he was First Team All-SPSL 4A as a pitcher during his junior year. He previously earned all-league second team as a sophomore. On the mound he boasted a 1.71 ERA last spring, and he has a single-game high of 14 strikeouts. A two-time Team Most Valuable Pitcher, he earned the Coaches’ Award in 2016 and he helped lead the team to playoffs as a freshman in 2015. “Peter is a quintessential competitor. A young leader that works tirelessly to get the most from himself. Peter will bring a great attitude and competitive drive this summer. We look forward to his growth and our continued relationship with Ridgefield,” stated University of Portland Assistant Coach Connor Lambert. 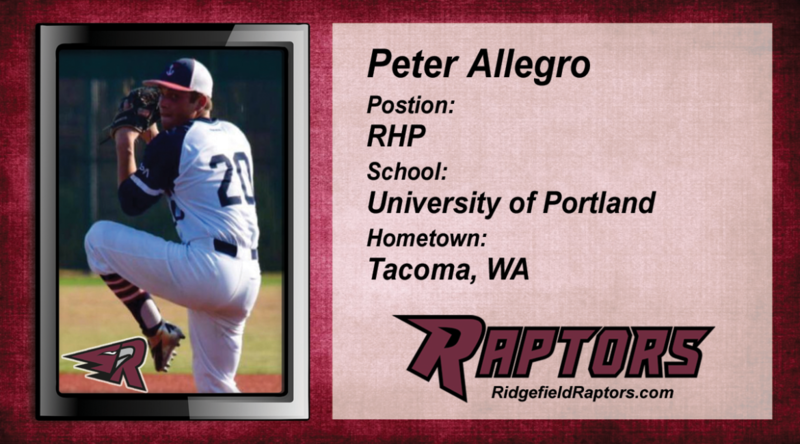 Please join us and welcome Peter Allegro to your 2019 Ridgefield Raptors!